Hi there, your download is ready. Marketing organizations need to adapt to a new model – one where value-added content, integrated multi-channel campaigns, and clear metrics are the keys for success. Create your own high-performance marketing department today by putting the right staff, structure, and budgets in place. You will reap the rewards in higher ROI and profitability, as well as the thanks of your executive team. 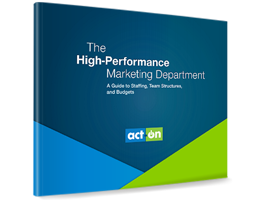 Hi there, learn how Act-On can help you create a high-performance marketing team. Copyright ©2008-2015 Act-On Software, Inc.